I’m excited to have teamed up with feedfeed and method today! It’s my pleasure to feature Brooklyn-based designer Rebecca Atwood’s beautiful limited edition naturally derived gel hand wash. This collection features four fall-inspired fragrances; each originally designed with painterly patterns to be a sophisticated addition to your home. Each is thoughtfully made and available exclusively at Target (in stores and online). One of my particular favorites is the Pumpkin Clove, so I’ve created a new recipe just for it. 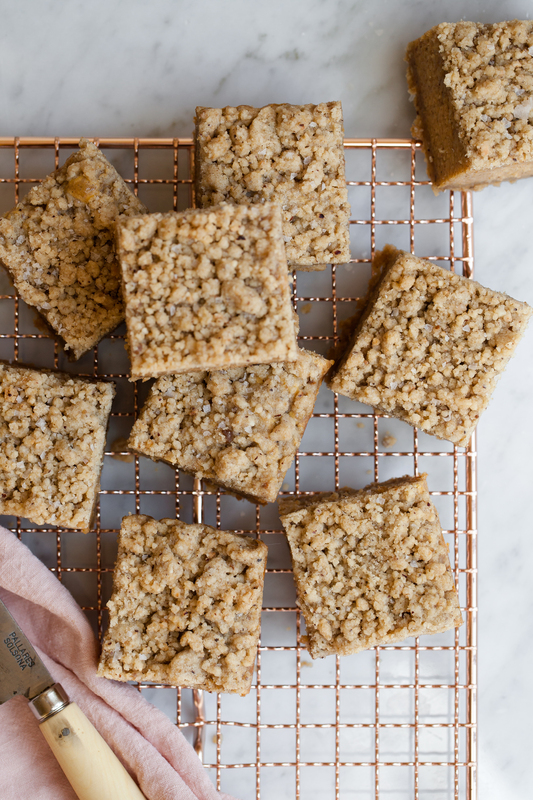 Inspired by its warm inviting scent of fall spices these Pumpkin Clove Pavé Bars with Hazelnut Streusel are a comforting dessert to usher in the cooler fall months. Pavé bars are a French inspired pastry meaning ‘slab’ or ‘brick.’ It’s in reference to the shape of the bars only, since these bars are creamy and light on the tongue. The crust and streusel toppings are made from the same hazelnut dough, which makes it simpler to create. The hazelnut flour used in this recipe can be purchased at a specialty grocer or better yet- make your own at home. It’s very easy to do. I’ve included the how-to in this recipe just in case you’d like to try it. Once you do, you’ll be making your own nut flours from here on out. It’s always exciting to come across recipes using nut flours since it’s a fantastic way to add texture and flavor to pastries. The pumpkin clove filling is rich, creamy, and bursting with the same fall aroma as this designer soap. The contrast of lightly crunchy streusel and silky spiced filling will have you wanting to curl up with a warm blanket and longing for the fall leaves to change color. If you’re a follower of Now, Forager, you’ll know that it’s not often that I feature a sponsored post. I must have a sincere interest in the company, its product, and its philosophy. method fits all of these as they provide design-driven and planet-friendly products. Their products are animal friendly, climate conscious, and environmentally responsible. They have also collaborated in several limited-edition collections each year with inspiring artists such as Rebecca Atwood. She’s an artist who blends traditional textile techniques and hand painting to create products that are both simple and luxurious. Her textiles focus on hand dyeing and painting making them truly unique. It’s a brilliant collaboration that allows everyone the opportunity to have a consciously selected and aesthetically beautiful every day product in their home. It’s the small details that make a home more inviting and to know that the daily products that I use are both lovely and safe for the environment matters to me. As an editor for feedfeed, I’m aware of feedfeed’s dedication to locally sourced products and expertise in selecting safe, nourishing, and sustainable foods; making this collaboration a perfect fit. 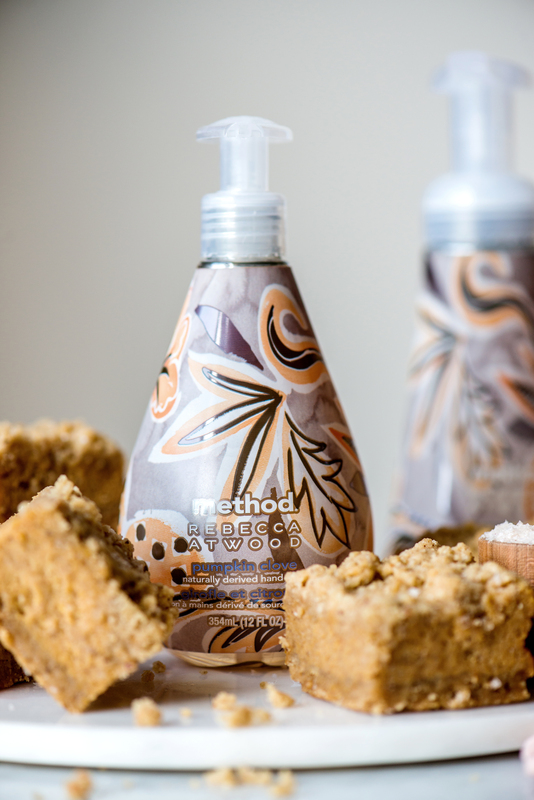 You can view the full line of method + Rebecca Atwood limited edition naturally derived gel hand wash fragrances here. Visit the feedfeed website to enjoy the other method Home + Rebecca Atwood inspired recipes created exclusively for this product line. Preheat oven to 350F. Line an 8x8-baking pan with parchment paper on both the bottom and sides. To make the hazelnut flour (if not using store-bought), place ¾ cup of whole hazelnuts onto a baking sheet. Transfer to the oven to toast for 10-15 minutes or until lightly golden. Remove from oven and let cool slightly. Wrap hazelnuts in a large kitchen towel and rub together to remove skins (it’s ok if some skins don’t rub off). Once hazelnuts have cooled, place them in a food processor and grind into a fine meal/flour. Take care not to process too long or it’ll turn into nut butter. In the bowl of a stand mixer, with a paddle attachment, combine the ingredients until streusel forms. Mixture will be sandy with no butter streaks remaining. Transfer half of the streusel into the baking pan. Press the dough evenly onto the bottom of the pan to form a crust. Bake for 12-15 minutes until lightly golden. Remove from oven and let cool on cooling rack. In the bowl of a stand mixer, with a paddle attachment, cream the cream cheese until smooth. Mix in the sugar, vanilla bean, all-spice, clove, cinnamon, maple syrup, and kosher salt. Add pumpkin puree and mix until fully incorporated. Stop and scrape down the sides and bottom of the bowl as needed. On low, slowly add in eggs. Stop and scrape down the bowl. Increase speed to medium and mix until well incorporated, about 1 minute. Pour filling into prepared crust. 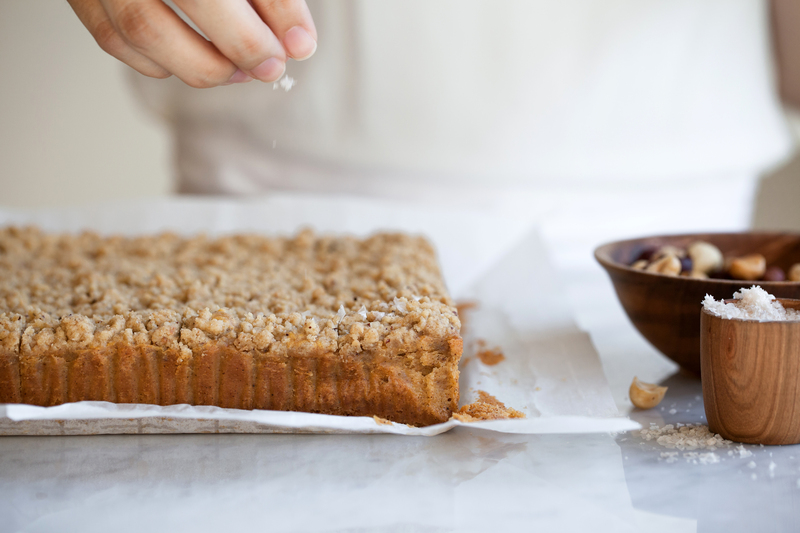 Sprinkle with remaining half of hazelnut streusel. Bake for 1 hour 10 minutes until filling is set in the center and no longer jiggles. Remove from oven and set on cooling rack to cool at least 8 hours, preferably overnight. 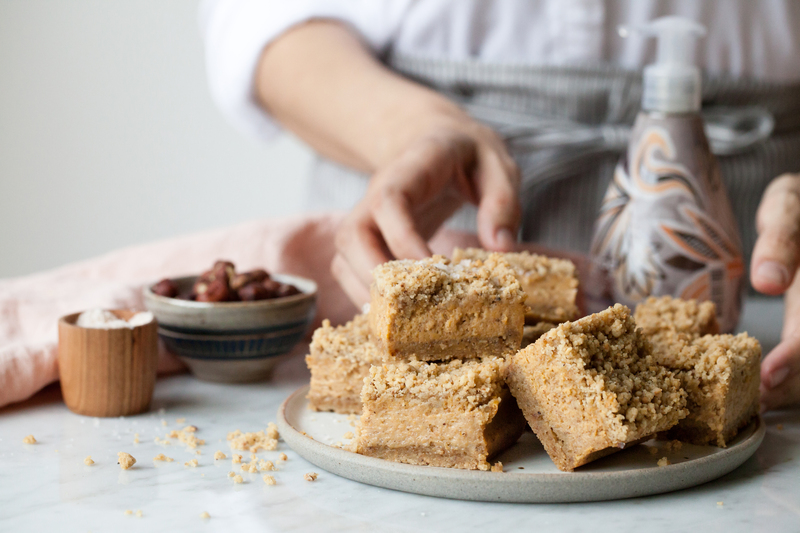 Sprinkle bars with flaky sea salt and cut into 2-inch squares. Pumpkin Clove Pavé Bars may be stored at room temperature, in an airtight container, for up to five days. *Disclaimer: This post was sponsored by Method Home and feedfeed. All opinions and thoughts are my own. A big THANK YOU to Method Home for their generous provision of the Rebecca Atwood Pumpkin Clove hand wash products to create this recipe and post!